Published in 1927, The Tower Treasure is the book that introduced the teenage heroes, Frank and Joe Hardy, and which also began the series that would introduce generations of young boys to the world of crime fiction. The series ran until 2005 and consists of one hundred and ninety volumes, although some purists insist that only the first fifty-eight novels constitute the real Hardy Boy Mysteries. The books were written by "Franklin W. Dixon," the pen name used by a stable of writers who worked for the publisher that produced the books. This first volume was written by a Canadian author, Leslie McFarlane.As the book opens, Frank and Joe, sixteen and fifteen respectively, are riding their motorcycles down a narrow road, when a speeding car nearly runs them off the road. Later, the car is found wrecked and the driver has apparently stolen a yellow roadster belonging to one of the Hardy boys' chums. (There are a lot of "chums" and "lads" in these books.) The first mystery to be resolved in the book then, involves finding the stolen car. But soon, another more serious crime is committed when the house of one of the town's wealthy families is robbed. the caretaker, who is the father of one of Frank and Joe's sons, is the prime suspect. He's fired and later arrested, with devastating consequences for his family. The Hardy boys are the sons of the famous detective, Fenton Hardy, who agrees to look into the case. But when he can't come up with a solution, it appears that only his sons may be able to solve the crime and save the family of their friend.This is the sort of tale, along with others like it, that prompted many a young lad to race home from the third or fourth grade on a winter afternoon, grab a couple of cookies and a glass of Kool-Aid, and curl up with a book for the rest of the day, sometimes ignoring his own chums who were outside playing at one thing or another. Later that lad might get to be eleven or twelve years old and discover in his father's library Erle Stanley Gardner's The Case Of The Vagabond Virgin. And sadly, once a lad has moved on to books with titles like that, there's no going back to the Hardy Boys. One can only move forward to Raymond Chandler, Lawrence Block, John D. MacDonald, John Sandford, Michael Connelly, and a host of other writers that might well tempt a man in his thirties or forties to bag work early in the afternoon, pour himself a beer or two, and settle in with a good book. But whatever his age, he'll always owe a debt of gratitude to those authors who got him started. ★★★★★★★☆☆☆[7/10]✅Frank Hardy is eighteen, OK? He could definitely do well to handle a case which doesn't have the culprits leaving bread crumb trails, particularly keeping in mind to make sleuthing easy for the young detectives. ✅The older detective could do well to remember that his sons are capable of doing this dirty job all on their own and get off their case. ✅Famous Five adventures have more nail biting moments than this one and Famous Five is only a bunch of kids! Ah, childhood. When life, as well as the pleasures, were simpler. And one of those simpler pleasures was reading these books about two brother detectives, their friends, and the adventures they had fighting criminals in their fictional hometown of Bayport and elsewhere in the world.I have to give credit to the library in my grade school for introducing me to their extensive Hardy Boys collection. I used to eagerly await the end of classes to get the chance to borrow a worn book at least once a week and read it at home.In an age of innocence, the Hardy Boys series provided a rich fare for the imagination and fantasize about being a detective oneself. Reading their adventures takes one around Bayport, South Carolina, Pennsylvania, New Mexico, Florida; and other countries, imagined or otherwise: Mexico, Canada, Morocco, and many more. In a way, the Hardy Boys series is an imagination of America. In it, you will find two teen-age detectives who can be said to be the author's idea of an ideal American: tall, intelligent, technology-adept, and living in a small, nuclear family. Yet, you can also find criminals who can be said to be the complete opposite of gangsters like Al Capone or Lucky Luciano. Can you imagine criminals who do not seem to kill? Villains who would just knock or gas their victims or the Hardy boys, and only try to kill them near the end of the story? Unbelievable. But then, the series is made for kids and teen-agers.In contrast to today's superheroes with superpowers like Spider-Man, the Avengers, or Batman, the Hardy Boys series provided that middle ground where one can be a hero and still keep your feet on the ground.So despite its flaws, the Hardy Boys series is one great read and deserves to be in every school library's collection. Heck, every grade school boy (or even girl) should read at least two of the books. Who knows? It can set the kid to a love for reading. Now that's a simple pleasure with profound consequences. I know, this book is not a great book, not by any stretch of the imagination--and the whole series is dated now but I give the book five stars because the Hardy Boys' books was the series that made me a voracious reader when I was in elementary school. How much do the Hardy Boys's books mean to me? One of the best days of my life was the last day of school at the end of the fifth grade. One of my friends was cleaning out his desk and he had a stack of seven or eight Hardy Boys' books that he didn't want to have to carry home. I said I'd take them and he gave them to me. I had to walk a mile to my house, and the books were uncomfortable. I remember I had to keep shifting them in my arms, and their hard corners hurt my wrists. . .but it was worth it because it meant I had a good series of books to read at the start of my summer vacation. When I was a teenager I loved reading the Dana Sisters by Carolyn Keene. I own all of the old ones that were written before they were edited in 1959, and years later I began reading and buying the older Nancy Drew series. Here I am in my older years, and I am still reading them, but now I have added The Hardy Boys to the list of books I am in the process of collecting, but only if they, too, were written before 1959. I tried reading a Hardy Boys book several years ago, but I didn't care for it. Too much action; too unrealistic. Then I bought one at our library book sale and finally I liked them. This book, the first in the series, is a 1st edition written in 1927, and I got it cheap at a used book sale because the endband is missing and is taped with paper tape, which I had to replace. Then some pages near the end of the book looked like the factory cut them a little bit or maybe some kid had. Then there is a hole in one page, but it didn't destroy the words on the page, just gave the book more character.I wonder who owned this book? Why did they keep it for all these years? Books that are this old and are well read must have been really loved.So now the story: Frank and Joe Hardy are driving their motorcycles along Shore Road when a speeding car almost drives them over the cliff. They got a good look at the guy, a guy who will play an important part in this mystery. They drive on and come to a culvert and see and overturned car, but it was empty. Maybe the car that passed them had also run this car off the road, they wonder, or maybe the wreck was days old. They continue on and come to the Morton farm, their destination. Their friend Chet Morton was waiting for them and informed them that his roadster had just been stolen. And the mystery begins. Every book should have a bad hobo. Pa: So you finished The Tower Treasure last week after a long, long read. How're you feeling about it now?Miloš: Good.Pa: Just good?Miloš: Not exactly. I really did like the book. I like how they were private detectives. I like how it is set on the grounds of a tower, and I don't know, I just liked it and how it was set in the 50s, but I read it in the hundreds, whatever it's called. Pa: I suppose it's the teens now. It's not the noughties anymore.Miloš: Yeah. Pa: So who did you like better?Miloš: Umm ... Joe. Pa: How come?Miloš: Well, I like this moment in it somewhere at the end where Joe just starts thinking of stuff right off the bat. Pa: Like Sherlock Holmes?Miloš: Yeah. I guess I like both of them, though. Frank is the star of it; he's older by a year. They're both reall cool. Pa: Are you going to read more Hardy Boys?Miloš: Yeah. But first I am going to finish Frankie Pickle and the Mathematical Menace, then read James and the Giant Peach, then read book two. Pa: Wow. That's ambitious. Where's James and the Giant Peach?Miloš: I dunno. But I'll try and find it. Pa: I couldn't find it the other night. Miloš: You couldn't? Not in the house.Pa: None of the places I looked. We can both look again. Maybe it should be a Hardy Boys mystery? You could clues and hunt it down. Miloš: I think I know where it is?Pa: So I lookked for a half an hour and after two seconds of thinking you know wehre it is?Miloš: Where?Pa: Didn't you just say you know where it is?Miloš: Oh! In the car. Pa: I see. I'll check when I go to work.Miloš: I can check now. Pa: Anything else to say about the Hardy Boys?Miloš: No.Pa: You're effusive.Miloš: Although it was cool. Pa: I'm going to read it again soon. So we can chat about it. Maybe we should do this interview thing for my review. You can ask me questions.Miloš: Sure.Pa: Groovy. Go look for your book. Just for a laugh, I decided to read this first installment of the famous Hardy Boys mysteries. As a kid, I had read one or two of the original stories, as well as a handful of the "Hardy Boys Casefiles" series-- the updated, more contemporary adventures of Frank and Joe Hardy (at least for the 1980s)-- but I never fully got into them; now I wish I had. Going back to the first book of the original series, there are certainly lots of anachronisms to laugh at: referring to friends with nicknames like Biff and Slim as chums or fellas, lines like "'Good night!' chorused the young sleuths," and Frank and Joe's boyish innocence and exuberance despite being 18 and 17 years old respectively. But it's amazing how well the story itself it holds up-- I was definitely entertained and sincerely wanted to know how the case would be solved. For sheer fun and simple entertainment, I would definitely recommend the Hardy Boys series to young readers, families, and anyone who just enjoys a good story. The iconic Hardy Boys, Joe and Frank and their intrepid father Fenton are a delightful crime-solving family and this is their very first adventure. It is full of cliff-hangers and fun. Actually written by a collective that hides behind the name Franklin W. Dixon, the books had to be re-written in the 50s to remove some of the inherent racism that pervaded them. My son and I have only read the more recent volumes. After this first one, my 9yo wanted more Hardy's and so far we have read seven of them. This first one is pretty good and a way of introducing all the characters and the circle of friends - the unforgettable Chet, Tony and Biff. As a kid, I read the whole series. My dad bought us a subscription, so I would get one every month. I can honestly say these books taught me the love of reading. When I got one in the mail, I would tear into it and not be able to put it down. I loved the suspense at the end of each chapter. Even today, the use of a hook will keep you turning the pages. I loved the simple adventures and the cool things the "chums" were able to do. There were boats, cars, and motorcycles, not to mention the cool remote locations they were able to go to. Now that I write my own fiction, I love to use some of the same tools the original "Franklin W. Dixon" used... mystery, intrigue, and a whole bunch of cool gadgets to bring the reader into the story. While the writing is a tad simplistic, the formula the authors used is wonderful. For a few years now, I've been interviewing my twins after they finish reading their books, posting those interviews on their own goodreads profile. My boy, Miloš, finished reading The Tower Treasure a couple of weeks ago, and I reread it just this week (I always reread the books they've read.) You can see my interview with him at this link. And you can see his interview with me right here:Miloš: Why was the book just okay?Pa: Well, I enjoyed it for what it was. The mystery was fun, and I really liked that most of the mystery was about finding the actual treasure rather than finding the thief, but the fifties world that they lived can't have really existed, except in books and on early TV, and I didn't like the attitudes that Dixon, he's the author, had about society and good & bad. That kind of stuff. Miloš: Okay ... which character did you like better, Frank or Joe?Pa: Are they different characters?Miloš: Yes.Pa: I don't know. They seemed kind of hard to tell apart. I liked Oscar Smuff best actually. But I guess if I had to pick one of the brothers it would be Joe because he fell over the railing in the old Tower and caught himself. I think hints at a more physical role than Frank's, maybe he'll be more impetuous in other books.Miloš: Do you want to know why they're different?Pa: I'd rather "how" they're different, but you can tell me whatever you think.Miloš: This really has nothing to do with it, but Joe is lighter haired than Frank, and Frank is older than Joe.Pa: But those are purely physical things. It's not like they're behaviour is different at all, is it?Miloš: I don't know. Pa: Why not?Miloš: It is different in a way. Pa: What makes Joe Joe? Cause I know you like him best.Miloš: The fact that at the very end he suddenly popped out good ideas, and he was the one that actually really made them find the treasure because he figured out where it was the old water tower.Pa: He was the one who said it was there, but Frank was thinking the same thing, remember?Miloš: Yeah.Pa: Is it that Joe wasn't afraid to think out loud, to maybe make a mistake, and Frank was keeping things to himself, and maybe was more self-conscious?Miloš: Yeah.Pa: Okay.Miloš: But at the same time, Frank is sort of the hero of the tale.Pa: So you like the underdog, the supporting character.Miloš: Yeah, sometimes I do the same thing with villains. I like the villains better sometimes like the Evil Emperor Zurg, or something like that.Pa: I do too. Which is why I like Smuff.Miloš: Because he's an underdog. Yeah Smuff was a really cool character, and it was very rude to make him miss his flight.Pa: I wasn't impressed with the Hardy's treatment of Smuff. Like you, that bothered me. it also bothered me that they always assumed Smuff was being "greedy" and wanted the reward, when they wanted exactly the same thing. So how can be better than Smuff when they have same motivation?Miloš: True. And at the end there, you can see he sort of says something about, or he arrives last on purpose because he doesn't really like the Hardys, does he? Pa: Or is it because he expects that they're going to humiliate him, so he isn't keen on showing up. Miloš: Exactly. He doesn't want get mocked for not finding the treasure, and at the end he sort of tells us that since he's been a detective he never is the one to figure it out it is always someone else, which makes him feel even more stupid because he hasn't found anything. So he tells them that.Pa: Yeah, poor Smuff. So do you have any other questions for me?Miloš: Not other than, "Was it a good book? "Pa: It was okay. I'm not sorry I read it again, and I am looking forward to reading the second one --Miloš: -- The House on the Cliff. Besides sometimes the third or the second can be better than the first.Pa: Looking forward to you getting through it, after James and the Giant Peach of course.Miloš: Okay. Nostalgia. When I was a young man, or younger than a young man, I delved and consumed Hardy Boy books as if they were the best thing ever. I remember that they had a section of these for sale in May Company in the mall. And if the next book in the series wasn't there on the shelf, we were devastated, and needed to bug our parents to come back again and again to get it. Maybe even travel over to another bookstore and hope that they might have it. Bookstores were not everywhere when I was unable to drive myself. Much as they are becoming again.First books in a series, a long series, do their best to introduce the various characters that will be in the series. This does that. It also gives us a little caper to follow through on. Perhaps an enticement that will make us love mysteries for the remainder of our lives. From the perspective of a child this is done, and probably done well. Though I imagine that the age at which one appreciates this has trended younger. And now as an adult, reading many mysteries and even writing a few, know about trying to pull the reader along, this does not hold for an adult.It works as a piece of Nostalgia and another time, another era, a remembrance for me of when I was young and clamoring for more of the series. But as an adult, perhaps something to share with a 'Tweener. But for it's own sake, there are much more tales with depth that I as an adult are more captivated by. I'm currently in the process of reading (and with Nancy Drew re-reading) children's mysteries for an upcoming project. As a kid, I read Nancy Drew/Hardy Boys SuperMysteries, but have never spent time with the Hardys on their own. 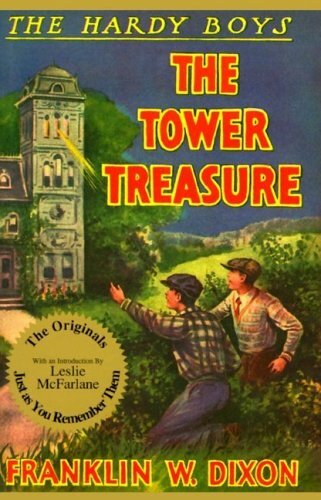 The Tower Treasure is Frank and Joe's first adventure and the audiobook is well read by Bill Irwin and produced with delightfully campy sound effects. I was surprised by how indistinguishable Frank and Joe are in their first outing, as I remember them having very distinct personalities in their outings with Nancy Drew. Joe does say "Good Night" as a swearword enough that every time I heard it, I knew Joe was speaking -- but that was about it.The plot coasts along, as the boys work to solve a mystery -- first to help a friend find his car and then to help clear the name of another friend's father. With the exception of a weird confrontation with a homeless man, everything was fairly predictable.What was surprising to me was the father/son relationship between Fenton and the boys. Fenton is a really great dad, training his kids to think on their own and allowing them to be a part of his work. He lets them take risks, but not so big of risks that it would naturally endanger them. I wish there was a similar mother/daughter vibe in Nancy Drew. Fenton was the real hero for me in this book. This was pretty decent, as i said in an update the cast where a little older than i expected. The story was also a bit more realistic and how much the heroes were able to accomplish without help seemed believable. It would have been nice if the female contribution was more than just baking but this is the 20's, i think the 20's and 50's are probably the most sexist of decades in terms of media, as the male-society reasserted its control after the relative female freedom caused by the war years, just a hypothesis.There's a good bit of interest in the outcome of the case as it effects some of the characters in the story in a very sympathetic way. So there is tension but on the other hand no actual jeopardy. Its like a 60's batman episode where batman and robin have been captured and the narrator says 'Can the dynamic duo free themselves from...' and before he can finish imagine that they've already escaped. Thats what happens here, any sign of possible physical jeopardy is so quickly dealt with it seems almost pointless that it was even mentioned, odd choice. There's a greater sense of danger in E.Nesbit books. The detective elements were quite good and overall i liked it more than i expected too. Rating: 3.90I really liked this book. It really kept me interested, thanks to the few twists and turns!It's been a while since I've read a good mystery and coming back to the hardy boys series reminds me just how much I love the genre. This book may have been short but it was teaming with mystery, suspense and just the right amount of humour. I adore frank and joe's relationship p, and I especially loved the way they behaved with their parents and that they didn't lose hope or give up just because they were stumped. The one thing that it didn't like though was the lack of character development. I liked to see the characters in a book have numerous sides to them. I felt like frank and joe were very 2 dimensional at times. But perhaps their personalities grow as the series progresses. They were too alike sometimes though I could differentiate that frank is the calm, cool and collected brother while joe is the impulsive and dare devil brother. Overall it was a good read and I hope to read the rest of the series soon. I don't know... It was kinda like a mix feeling and all. I used to really like mysteries and seeking out the bad guy books when I was younger, probably because times have changed and so have my interest. Yeah, probably. But it was an enjoyable read those, so there's that. Gee boy this book was swell. Very dated but a fun little read for my little boy. I'm sorely tempted to revisit other Hardy Boys and Nancy Drew titles now, but I'll probably let the impulse pass. The Hardy Boys, two clean-cut young fellows named Frank and Joe, are nearly run down on their motorcycles one afternoon. It comes out later that there was a robbery at the prominent Tower Mansion! The family, an aging bachelor and his worst-dressed sister issue a reward for the return of the stolen jewels but are pretty unwilling to trust two teens to search their house. Nonetheless, with a father of a chum wrongfully accused of the theft, and some advice from their P.I. Pop, the Hardy Boys set out to solve the mystery.I read the more commonly available revised version of The Tower Treasure, but I read up on the changes that had been made in the late 1950s to make the story more accessible to young readers and to mollify those parents who might object to a healthy dose of 1920s racism. This series, along with Nancy Drew, underwent some radical changes to bring their characters in line with the principles, for better or for worse, of the day.Frankly, the history of the changes made to the series and the contractually anonymous writers who made it happen, were more interesting than the story itself. There is some clever sleuthing and red herrings along the way, but its hard to read these stories with the same enthusiasm I did as a kid.I read the first Nancy Drew mystery, The Secret of the Old Clock, at the same time and had similar feelings. I decided to start reading this series because a few years ago my father gave my brother and I the complete boxed set of Hardy Boys books for Christmas. I felt bad because I never finished reading them, so I am going to try and read all of them. *I know I am missing a few because I dropped one in the pets' water bowl, but I think you can read them in any order.I had trouble with this one. The beginning to the middle was very slow and choppy. Also, the culture in this book is so old and the way they speak is so dated. For instance, one of them says something like "You grabbed onto that banister with flash camera speed!" And I'm sure feminists would be offended because the gender roles in this book are so old. There is a part where the boys' girl friends are in the house when the boys leave, and the girls cook food "so it doesn't go to waste." Also, they think a twenty dollar ransom is a fortune.But when I picked it up again, after about a week, I flew threw the second half. For some reason it got a lot better once you pass the midpoint. I thought the mystery itself was only decent.My biggest problem was with the characters. There is no character development and you can't even distinguish between the Hardy Boys, Frank and Joe. And the author just randomly throws in minor charcters that have nothing to do with anything.It's a mediocre start to a pretty famous series. I'll give it a few more books to get better. Also, I'm pretty sure a bunch of people write under the name of Franklin W. Dixon, so hopefully other writers will be better. My older son is still a couple years shy of reading these, but I have very fond memories of the Hardy Boys books. They introduced me to so many basic concepts of storytelling, and (to my young mind) they were exciting as all get out. I'm not going to put every single one of them on my Goodreads shelf ... just the ones that especially stand out in my memory. Classic mystery tale as two boys attempt to find a hidden treasure. What a swell stroll down my childhood memory lane! I knew going into the story that it was dated and meant for a younger audience so I didn't know if it would be enjoyable or not. I was pleasantly surprised to have enjoyed it so much. I listened to the audio version and enjoyed the additional theatrical sounds. As an adult, I didn't find it suspenseful although younger children might. The mystery wasn't overly complicated but wasn't solved within the first pages either. It was a nice change up from my usual reading list. And as an audio, it was only 3.5 hours long. I look forward to enjoying more of the series and sharing them with the kids. In this book, Chet, who is fat, grows upset when his jalopy is stolen, and also grows upset when sleuthing keeps him away from his Welsh rabbit, as he fears that good cheese has gone to waste. (It has not.) Chet doesn't get to do much sleuthing, hopefully not because he's fat. His friends, Frank and Joe, do, and they also see a performance of The Merchant of Venice and laugh hilariously because of the lead actor's comedy and gestures. Later, Frank and Joe distract Detective Smuff by setting a fire behind Rocco's market. Rocco is a recent Italian immigrant who is hard-working and simple. Frank and Joe later locate some stolen jewels. You know they locate the loot because the chapter in which they find it is called: "Loot!" Did you know that the Hardy Boy books went through a re-write in the 60's? Neither did I until I picked up this original print, and wondered why the phrases seemed so different. It was really kind of cool. If you happen to stumble into any Hardy Boys books with a 1920's copyright for less than $4 or $5 pick them up. Nostalgia... gotta love the Hardy Boys. Franklin W. Dixon Leslie McFarlane - Franklin W. Dixon is the pen name used by a variety of different authors (Leslie McFarlane, a Canadian author, being the first) who wrote The Hardy Boys novels for the Stratemeyer Syndicate (now owned by Simon & Schuster). This pseudonym was also used for the Ted Scott Flying Stories series.